Welcome the year with a dish guaranteed to bring you good vibes `til December. 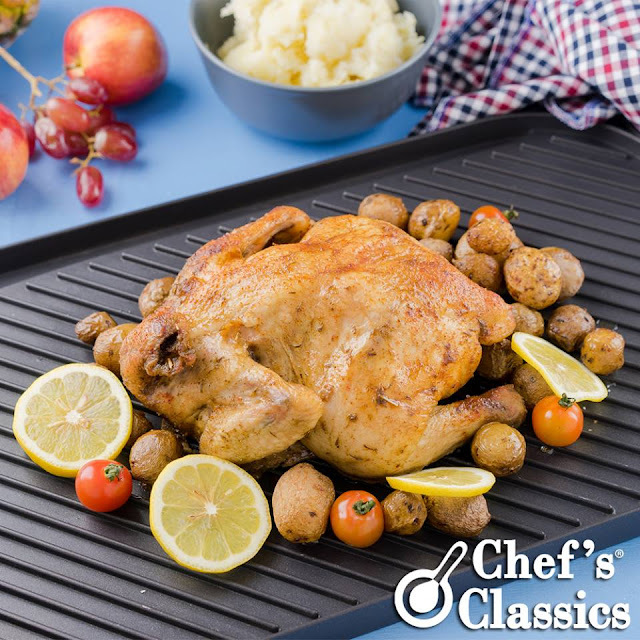 Serve our Rosemary and Lemon Roast Chicken, and it will definitely be a happy new year! 1. Heat oven to 190 C.
2. Chop rosemary, and mix with the butter, garlic, lemon juice and black pepper. Gently lift the skin away from the breast of the chicken and press the butter underneath on both sides and remaining butter mix to the skin. 3. Heat Chef's Classics Caper Grilled Rectangle, and add in extra butter. Saute onion, celery and carrots until fragrant. 4. Place chicken in the pan. Roast chicken for 45 minutes to 1 hour or until juices runs clear. 5. Serve with green salad or mashed potato. Yum!